$150 each. Vintage mid-century modern hand-blown glass oil lamps. 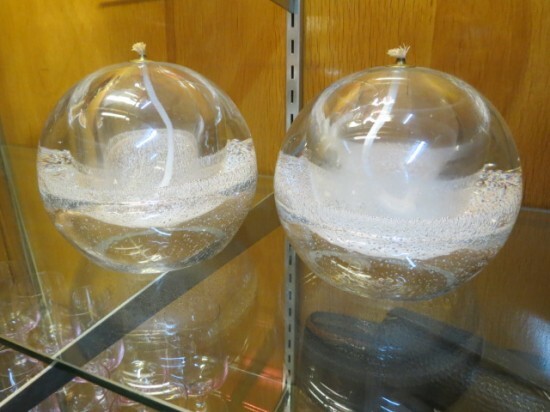 These clear glass oil lamps have decorative controlled bubbles. Use these to light up any room: by the bath, bedroom, kitchen, etc. Excellent condition. 5" wide and 4" tall. Delivery available. Call Lincoln Antique Mall for more information: (773) 848-3070. Address: 3115 W. Irving Park Rd. Open 11-7 Monday-Saturday, 12-7 Sunday. Voted best antique store in Chicago. Like us on Facebook to see the newest arrivals. WE BUY vintage and antique furniture, chandeliers. $150 each. Vintage mid-century modern hand-blown glass oil lamps. These clear glass oil lamps have decorative controlled bubbles. Use these to light up any room: by the bath, bedroom, kitchen, etc. Excellent condition. 5″ wide and 4″ tall. Delivery available. Call Lincoln Antique Mall for more information: (773) 848-3070. Address: 3115 W. Irving Park Rd. Open 11-7 Monday-Saturday, 12-7 Sunday. Voted best antique store in Chicago. Like us on Facebook to see the newest arrivals. WE BUY vintage and antique furniture, chandeliers.